Located in the Foyer, Building B, Caulfield campus, Monash University. Before the invention of the electronic computer, people used various mechanical devices to improve the accuracy and the speed of calculations. In this part of the display, you will find devices typical of the era before man's use of electricity, the abacus and the slide rule and adding machines, and examples of the first electronic calculators. Early calculators: The photo shows the display including a Millionaire, a geared mechanical calculator; the display includes a class room sized slide rule and various mechanical calculators. 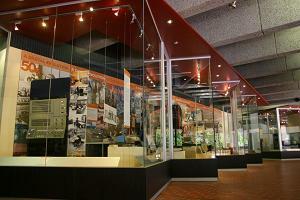 This major part of the exhibition displays the development of computers during the second half of the twentieth century combined with photographic images of changes in society at the same time. The visitor will see the rise of the personal computer with the local Microbee, early games consoles and the home computer starting with the early Apple computers. The display highlights the speed at which computers have developed from a room full of lights to an essential part of daily life. The 1970s: In the centre of the photo is an iconic image of the rebellious 1970s from the Melbourne The Age newspaper photo library. Images of each decade are set against contemporary computer devices. 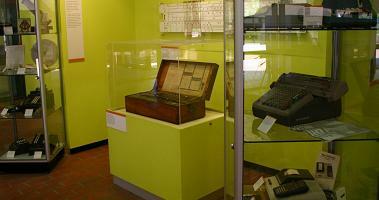 The centre piece of the museum is the Ferranti Sirius computer which was the first computer purchased by Monash University in 1962. Ferranti Sirius display was generously sponsored by the Australian Computer Society and the Victorian State Government through Multimedia Victoria. 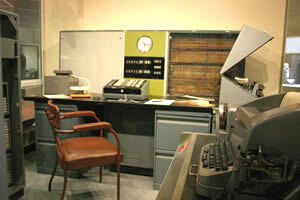 The display features a 1960s newsreel-style movie clip that was made to demystify the computer for the average office worker. The Ferranti Sirius Computer: The Ferranti Sirius on display at the Museum. MMoCH Collection 2007.0304. Professor Chris Wallace: Part of the biographical display about Professor Chris Wallace. Staff and students have been working on computers at Monash University since the early 1960s. 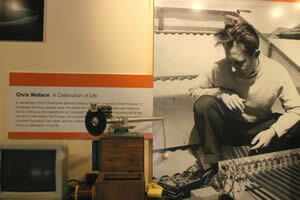 The museum has a changing display featuring the lives and works of notable people during that time. Presently the display highlights the achievements of: (1) Professor Cliff Bellamy FACS - our first Dean and first Computer Centre director, in many ways he lead the introduction of computers into Victoria; (2) Professor Chris Wallace FACM - our first Professor of computer science, inventor of the Minimum Message Length (MML) technique and (3) Professors David Abramson and John Rosenberg - while students of Computer Science at Monash, they developed new computers under the Monads project both went on to distinguished careers in computing research and education. Dr Andrew Prentice - a famous Monash mathematician and early eResearcher who modeled the formation of the planets of our solar system; installed 2005, removed 2008. Multimedia Victoria, Museum Victoria, Australian Computer Society, IKEA, The Age, Floorbotics, Microsoft, Holden Ltd. The curators, in order: Judy Sheard, Sarah Rood, Barbara Ainsworth.